It has been some time since I posted about Black Magic. The last, and only, blog entry solely about the title was almost three years ago (The Old Black Magic). I hope to begin posting more about it in the near future but today I would like to write about the nine Black Magic reprint comics that DC published between November 1973 and May 1975. These show up frequently on eBay and at comic conventions and generally are still reasonably priced. 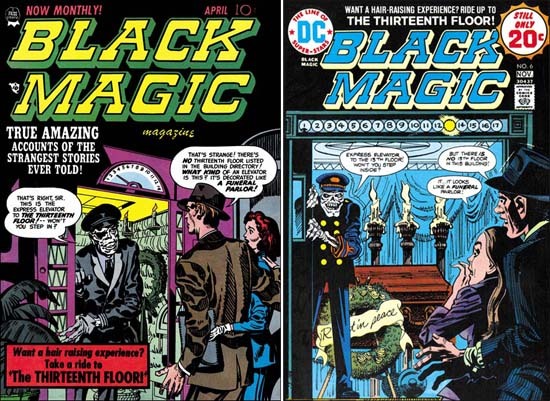 Given the value placed today on even poor copies of the original Black Magic series the DC reprints may seem like a cost effective alternative. They may be as long as the purchaser is aware of what he is getting. Seven of the covers of the DC reprints were penciled by Jerry Grandenetti and inked by Craig Flessel. Actually my crediting of the inking to Flessel is not based on any study but from conversations with Joe Simon. Joe told me that Craig did a lot of work for him at the time. When I asked what work that was Joe said he used Flessel to do Grandenetti’s inking but he did not identify any work in particular. Most of the covers, like issue #6 shown above were reinterpretations of the covers that were originally done by Jack Kirby. 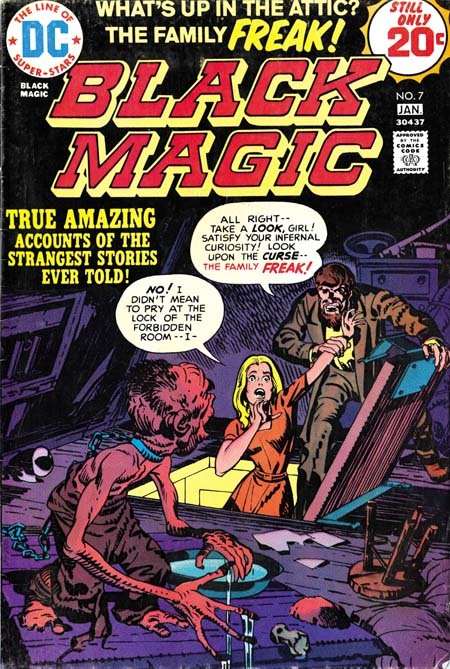 Today it sounds like an odd thing to do but when the reprints were published most readers probably had not seen any of the original Black Magic comics. Three of the coves were original compositions by Grandenetti based on reprinted stories. Frankly Jerry’s reinterpretations are better then his own more fully original covers. One of the covers used for DC’s Black Magic reprints was one never published before. 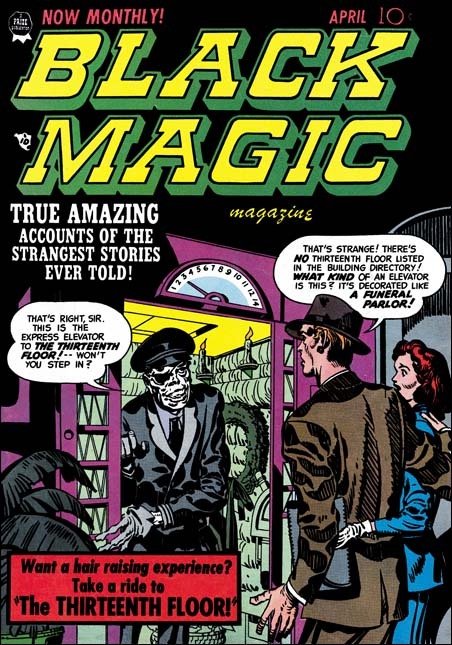 There are at least three versions of this image that Simon and Kirby intended for the first Black Magic cover. 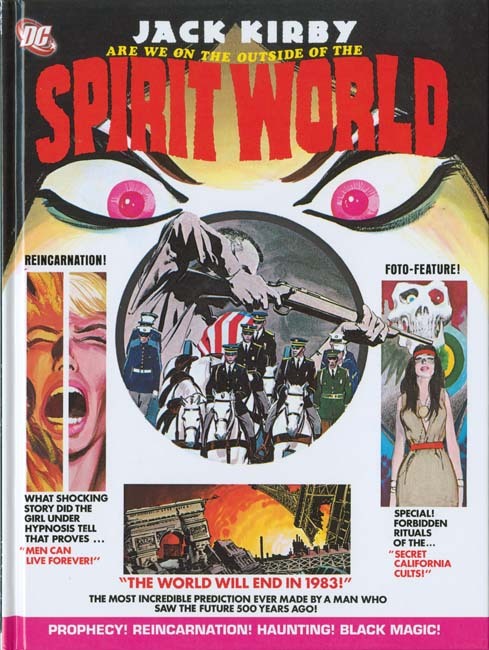 I guess in the end they were not satisfied with any of the versions and used a story about an evil doll as the basis for the published cover. The version used for DC issue #4 was altered slightly by the odd inclusion of an upside down lion in the upper left. I really do not know what to make of it. It seems so out of place with Simon’s typical designs and the art does not seem to match Grandenetti’s style either. The other Kirby cover appeared on DC issue #7 but originally on Black Magic #17 (October 1952). It was a great choice it was one of the best from the entire Black Magic series. But look at that woman’s face, that does not look like Kirby! In fact it does not match the original version and looks like the work of Joe Simon. I have heard it from many people, Kirby did not draw beautiful women. It is a remark that I truly do not understand, at least for the period of the Simon and Kirby collaboration. Granted the lady in the first panel of the image above leaves much to be desired but surely as depicted in panel 4 she would be described as pretty? Even in the last panel where she is overwhelmed by emotions, I would hardly call her unattractive. Surprisingly Joe Simon shares the same general opinion. 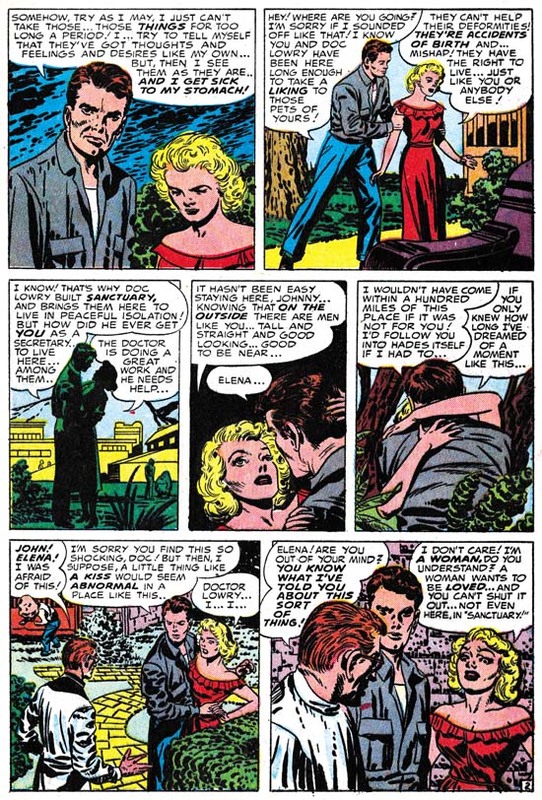 In the earlier issues of the DC reprints he replaced Jack’s woman with a creation of his own. Is it truly an improvement? Well the first panel came out better and I leave it up to the reader whether which version of panel 4 is the most attractive. However in the last panel Joe has completely lost the emotion. It is in conveying the emotions of woman that Kirby is truly at his best and that, for me, is why his females are truly beautiful. 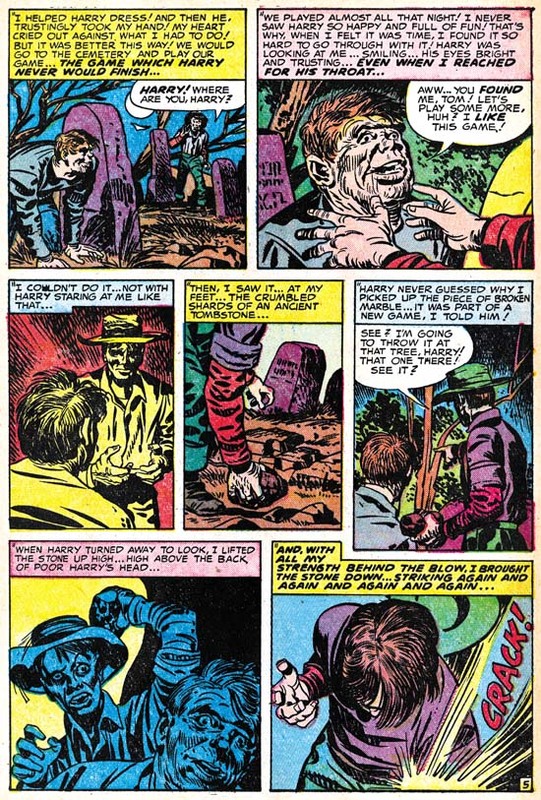 A careful observer may have noticed that the two pages of “The Greatest Horror of Them All” are not identical even when Joe was not purposely changing the art. There are subtle differences in the inking as well. 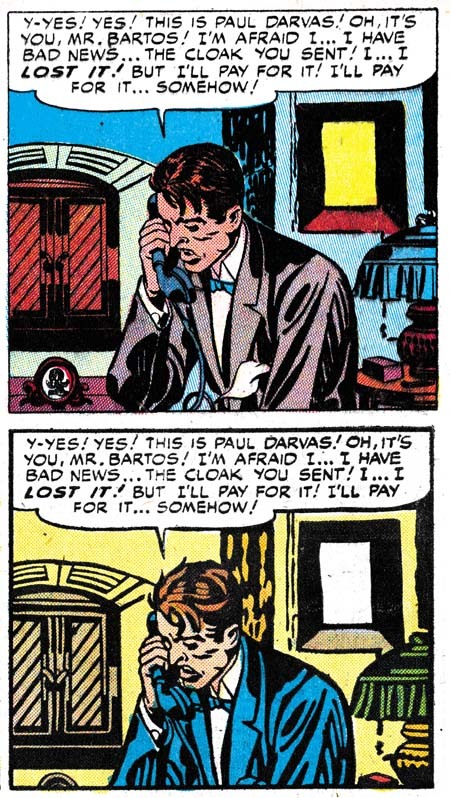 The art presented in the DC reprints was not made from bleached comic pages. Simon probably knew even then how to remove the color from old comic books. But the bleaching process does not completely remove the color and more importantly the copiers need to provide a quality finish to the process were not yet commonly available in the early ’70s. Instead I believe Joe worked with a technique that I know he used earlier in the Harvey reprints of Fighting American. He re-inked the art on tracing pages over blown up copies the original, but probably bleached, comic book pages. Generally Simon was very careful to trace the original brushstrokes, but sometimes, such as the panel from “The Angel of Death” he did not do so. It may seem surprising that Joe, who had done so much inking over Kirby’s pencils, would have trouble re-inking the reprints, but the use of tracing paper obscures the art in a way that working on the original pencils did not. Also not that panel from the DC reprint is higher then the original. Oddly this was due to the smaller size of the comics in the ’70s as compared to the ’50s. The size difference is not in the height but in the width of the page. The art in the DC was slightly reduced in size to accommodate the narrower page. To avoid an overly large top and bottom margins some panels were extended in a vertical direction. There in a small strip of art that was not present in the original comics. Expanding the panels was only done in the earlier DC issues. Later the Black Magic title that appeared at the top of the page was replaced with a larger version that was also moved further from the panels. This fixed the problem of the over sized top and bottom margins without the extra work involving in adding the new art to the extended panels. The examples I have provided of the re-inking are really the extremes. Most of the art was recreated well enough that only a close examination reveals the differences. But starting in DC issue #6 and completely dominating issues #7 to #9, are some completely heavy handed re-inking. Even without comparison to the original Black Magic stories it is easy to see something is wrong. Look at the inking in the bottom panel from “The Girl Who Walked on Water”; it looks more like a wood cut then the work of a brush. The sudden appearance of this type of inking convinces me that Joe was not the re-inker. He had handed off the work to less skillful hands with rather disastrous results. It is like watching a train wreck. I just cannot help myself from providing another comparison between the “woodcut” inking and the masterly studio style inking of the original. So far I have been describing the art, but were the stories changed when DC reprinted them? 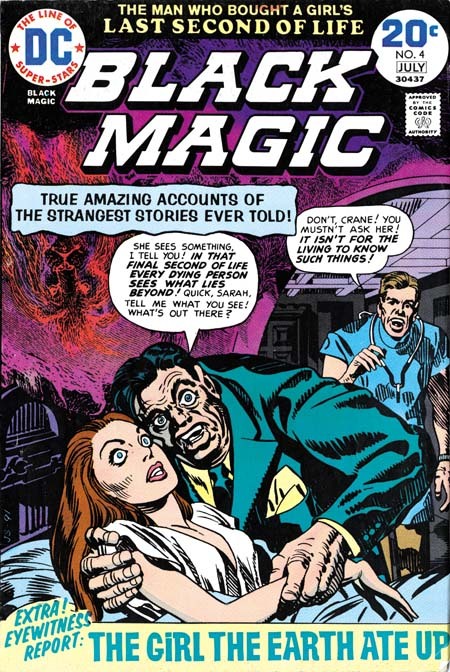 There is good reason to expect that they might have been as the original Black Magic was produced before the creation of the Comic Code Authority. In fact one aim of the Comic Code was to eliminate horror comics completely. In this they succeeded and Black Magic was one of the casualties. But after awhile the Code was relaxed slightly and Prize resurrected the Black Magic title in 1957 this time with the help of Joe Simon alone. Although the title was brought back the content could not be, the Comic Code would not allow it. However by the ’70s the Code had been relaxed even further. In fact horror comics were in a period of popularity. It was still tame stuff compared to what was done pre-Code at say EC, but at least it was permissible to have stories about vampires, werewolves and other monsters. 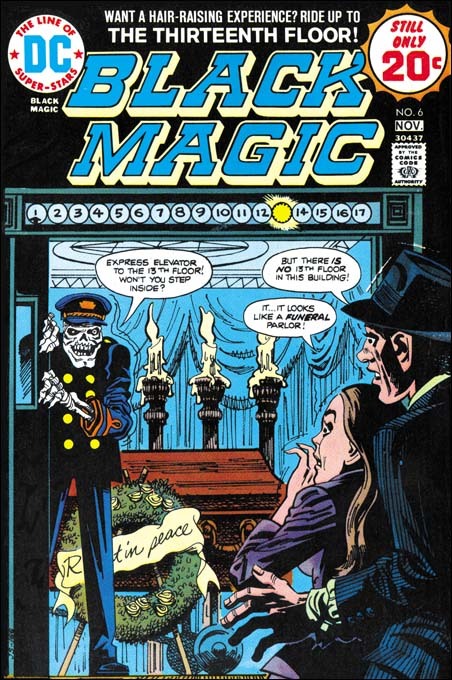 It is an indicator about how relaxed the Comic Code had become in the ’70s as well as how comparatively tame the original Black Magic series were in the early ’50s that I have only found a single case of a story changed for the DC reprint. This was the total elimination of page 5 of the story “Maniac” along with some minor modifications to the captions of the next page to accommodate the sudden leap in the story. So are the DC Black Magic comics a relatively cheap replacement for the much more expensive Prize Comics version? Yes if all you want is a good read. But if you want to study the art closely the reprints are simply not the thing to examine. The best description of the process used in making the reprints is recreation. 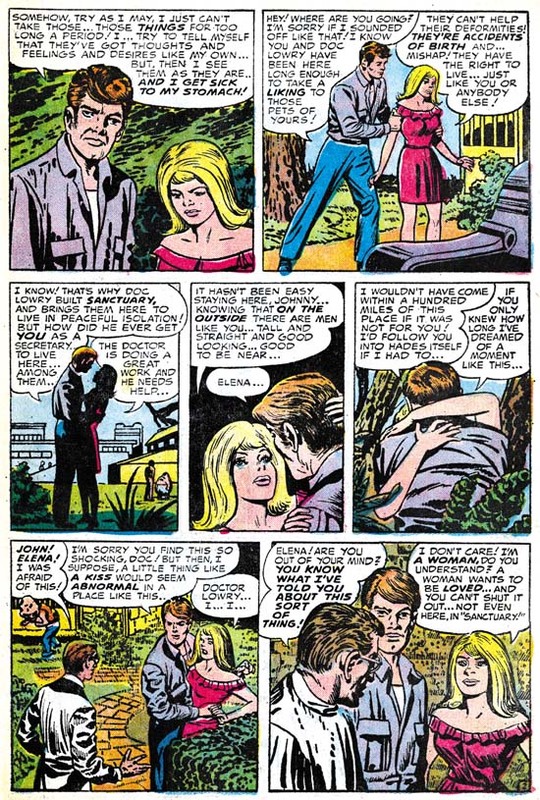 In discussions about the art recreations in recent Marvel reprints many have pointed back to the technique that Simon used as justification for similar methods used today. This is ironic because while Simon was limited by the primitive technology then available, today we have computers, scanners and quality printing. I have created a checklist for the DC Black Magic that includes references to the original source. It is available in the sidebar as well. 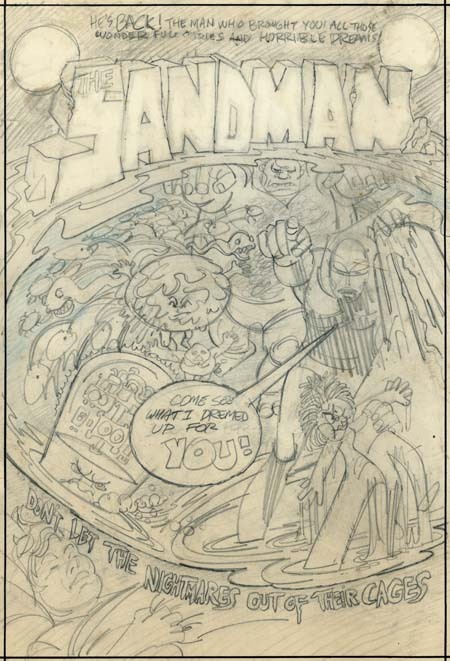 A few months ago I posted on a cover rough that Jerry Grandenetti did for the 1974 version of the Sandman. Kris Brownlow provided an image from an old eBay listing which, to put it kindly, was of a rather poor quality (the eBay lister’s fault, not Kris’s). Happily I have been able to obtain the original piece through the help of Scotty Moore. This obviously refers to the golden age version of the Sandman that Simon and Kirby produced. 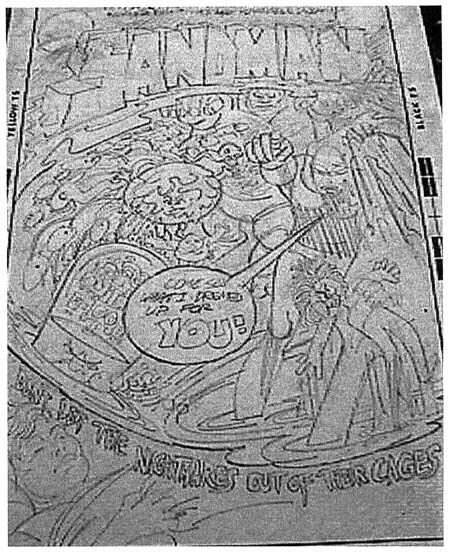 Potential readers would likely have been aware of that Sandman from reprints that had appeared in the back of the various New Gods titles. Now that it is possible to have a good understanding of the cover rough, it is clear that there is a correspondence between Grandenetti’s rendition and Jack Kirby’s published version. I previously pointed out that the machine head guy on the lower left was common to both. Also the group of snakes became represented by a single serpent. Now it can be seen that other figures correspond as well. The small man a little left of center on the cover rough becomes the scaly man on the bottom of the dream scene on the published cover. Also a little left of center is a figure whose body is nothing more then a circular head with small face surrounded by a rough or folded skin. In Kirby’s drawing the face becomes larger to encompass the entire head, but the folded skin and lack of a true body leave little doubt that it represents the same figure. 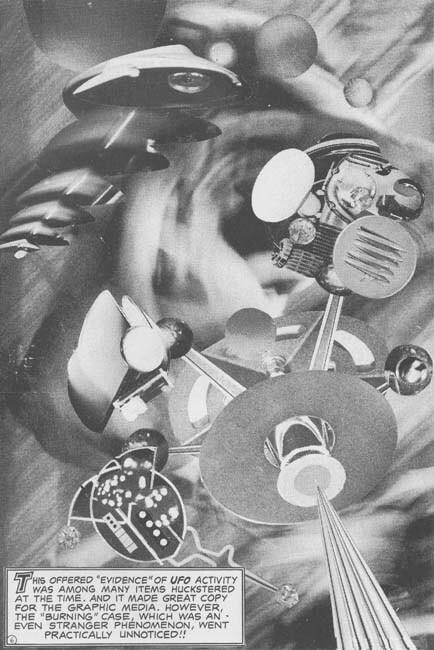 Grandenetti’s muscle man on the upper right was retained by Kirby although the arms, originally in a Frankenstein pose, were changed to bring the hands together. Grandenetti had a number of circles with multiple legs (spiders?) on the left, which Jack did not made use of. Further Jack dropped the arm holding the doll and added a mysterious and threatening set of eyes. Of course the most important change is that Grandenettis’s Sandman had been delegated to the side almost lost among the dream figures. 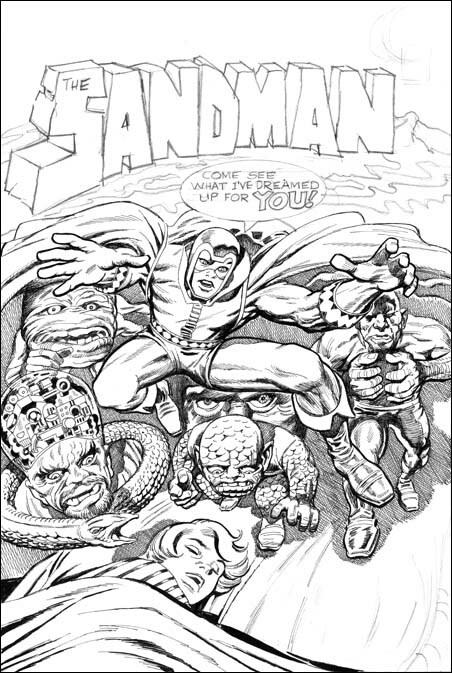 Kirby instead placed Sandman front and center using his signature exaggerated perspective. There is no doubt in my mind now that Jack saw either this Grandenetti cover or, less likely, yet another version of it. This is convincing evidence that the bronze age Sandman was originally a Joe Simon concept. At that time Joe had been doing a number of projects for DC. Simon would be the creator and writer while another artist, generally Grandenetti, would do the art. Originally Sandman was going to be nothing more then another comic that Simon would produce for DC. However remembering the success of the golden age Sandman, Carmine Infantino probably twisted Kirby’s arm to got him to team up once again with Joe. But Jack had a long period of creating and writing material without getting the proper credit and had only recently been able to escape that fate. Now he was thrust back to teaming up with another and, worse yet, working on someone else’s concept. Despite the success of the new Sandman, Jack would not, in all likelihood refused to, continue his collaboration with Joe. 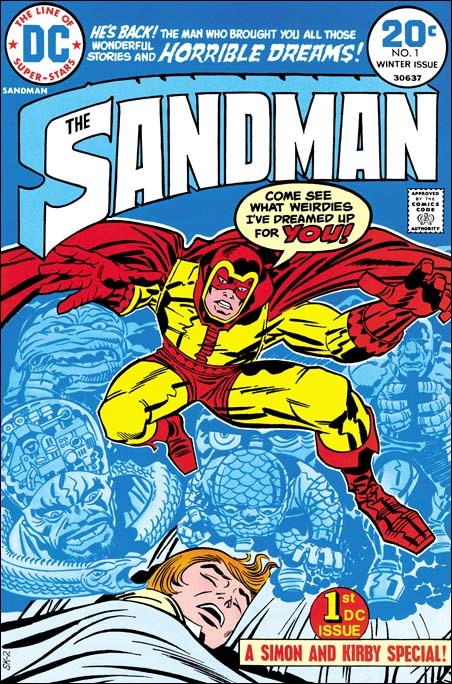 Thus a Sandman was the first comic that the Simon and Kirby teamed did for DC and it would turn out the last not only for DC but anyone else as well. The resurfacing of the Grandenetti cover is very fortuitous as I was planning to sometime in the next few weeks to post on the golden age Simon and Kirby Sandman. If that is not enough Sandman for you, I will also post sometime soon on a question I was asked by Scotty Moore about what was used as the basis for the inking of the published version of the Sandman #1 cover. An idea for a crime comic proposal? Posted December 13, 2006 in 2006/12, 9 DC (late), Featured Work, Periods, Topic, z Archive. This is my last post about Simon and Kirby covers selected as their favorite by participants of my recent contest. I saved this particular one for last because it was, at least for me, the most unexpected. 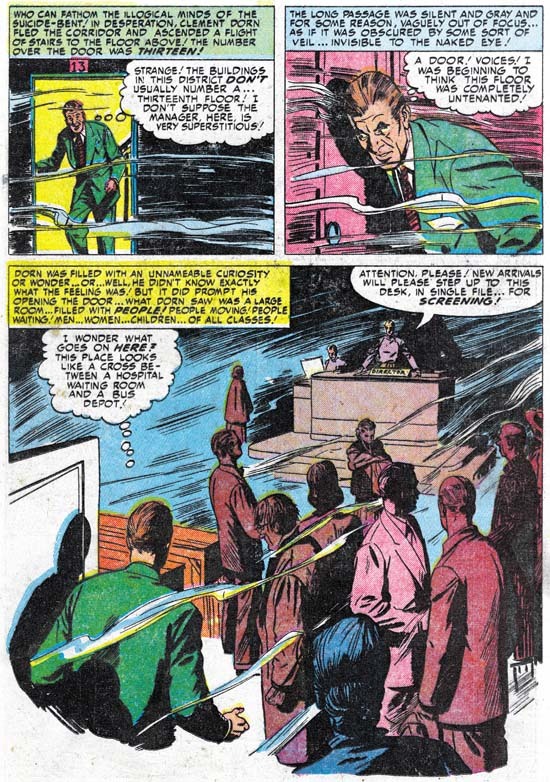 When I think about the Simon and Kirby collaboration I think about the period from when they first teamed up in 1940 until the work they did for the Adventures of the Fly in 1959. There were some S&K work published later like Blast Off and Harvey’s Fighting American. However this was not new truly new work but earlier work that just had not been published before. From 1960 on Joe and Jack had gone their separate ways, that is until Sandman #1 in 1974. In 1970 Kirby, dissatisfied with his treatment by Marvel, had signed up to work for DC. Here he started to create his New Gods opus. But Jack wanted more then just to draw these comics. He desired to initiate new titles and then hand them over to other artists. What Jack wanted was to produce these comics. In effect to return to the type of business arrangement he had during his collaboration with Joe Simon, but to do this by himself. However Jack was not successful in this endeavor. He never managed to pass the drawing chore to anyone else and worse yet some of his titles were cancelled. Jack continued to work for DC but the arrangement was not the same. Although he still was more then just another artist, he started to receive direction from DC’s Carmine Infantino. It must have been a bitter disappointment for Jack. Even more so when Joe Simon started to also work for DC in an arrangement very much like the one Jack had failed to development. Joe was more then just an editor, he was producing his comics for DC. With both Joe and Jack now working for DC, it must have been an obvious idea to Carmine to have them team up once again. After all Simon and Kirby had a number of great successes in the past, why not see if they could re-create their old magic? Of course with Jack living in California and Joe in New York, there was no question of the same type of collaboration that they had previously. I have been told that there is a cover proposal for the Sandman drawn by Jerry Grandenetti. If that is true it would suggest that originally Sandman was Joe Simon’s idea as Jerry was one of the artists doing work for Joe. 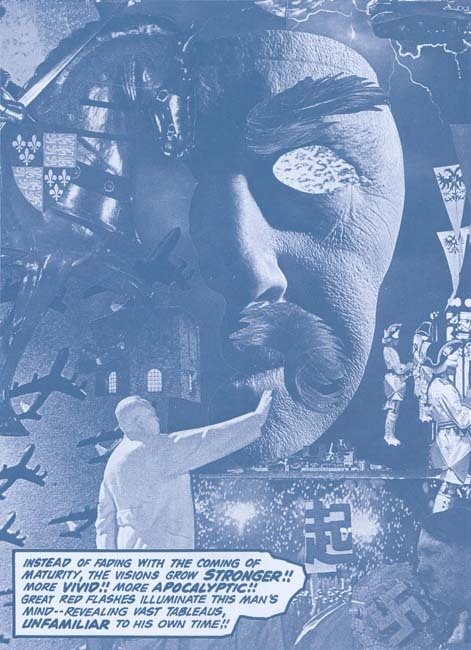 (I have seen another Sandman cover reported to be by Joe Simon, but that is clearly a misattribution because it is not in Joe’s style.) The credits for the comic give Joe as the scripter and Jack as editor and drawer. You can see that the cover for Sandman #1 has a job number, SK-2. The same job number was used on the first page. Well the SK obviously stands for Simon and Kirby. But if that is true why the ‘2’? Does that suggest there was a previous piece of artwork given the job number SK-1? There is another version of this cover that was actually inked by Joe Simon. Joe has said that this the original cover that was rejected by DC because of all the “hay” (crosshatching). That may very well be true, but I also wonder if perhaps Jack was unhappy with some of the liberties that Joe took. 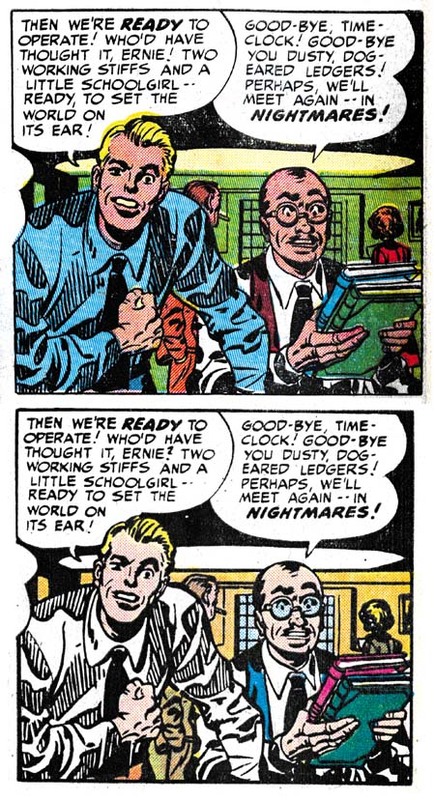 For instance Jack’s square finger tips were rounded off in Joe’s inking? With the type of distribution at the time it is hard to be absolutely sure how well comic books really sold. But it appeared, at least to Carmine, that The Sandman had been a big success. However issue #2 had a cover date of April 1975. This suggest that the original was planned as a one shot but that with its success more were published. 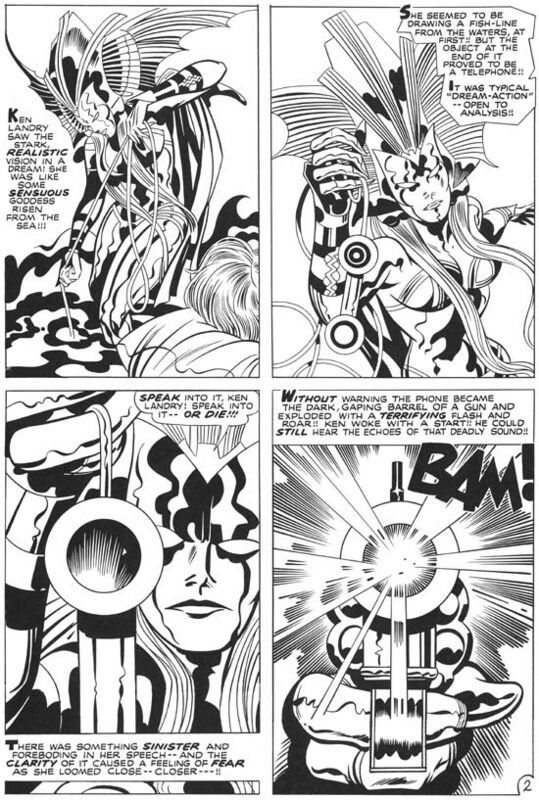 However succeeding Sandman issues were not Simon and Kirby collaborations. 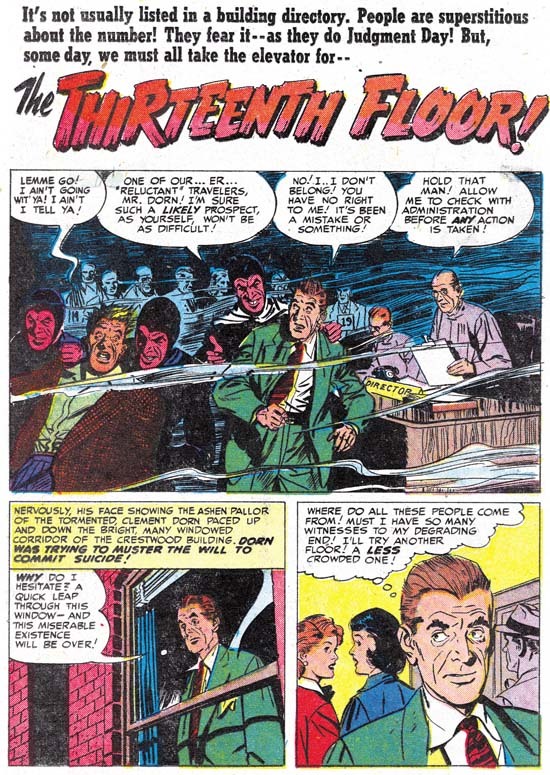 After a brief revival for one issue, the Simon and Kirby team had again ended and would not produce any further comics.